Biologically active food supplement preventing osteoporosis. From 2009 Pharmaval successfully presents on Russian pharmaceutical market a range of European highly effective products. Today our registered and promoted product portfolio includes POXCLIN – coolmousse for chickenpox symptoms relief, FEELWELL – food supplement for osteoporosis prevention. In 2009 two nasal powder sprays – NASAVAL (for flu & colds prevention) and NASAVAL PLUS (antiallergenic) – were launched on the Russian market. Later these two products were transferred to Italian pharmaceutical manufacturer Zambon. Besides, Pharmaval provides a wide range of services for those, who need professional assistance in launching or developing pharmaceutical business in Russia, CIS and Eurasian Economic Union. 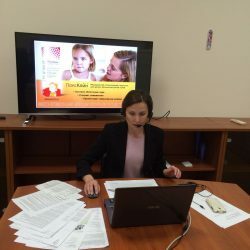 May 24th the company “Farmaval” together with company “Katren” held a webinar on the medical device Poxclin “Modern approaches to the treatment of chicken pox symptoms” for employees of pharmacy chains. The webinar was attended by 129 pharmacists.